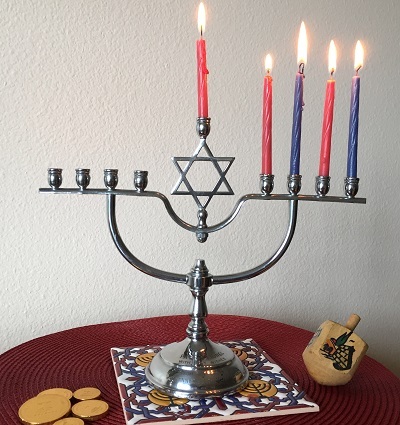 A Kidney Donor, her Recipient and a Thanksgiving Dinner: Hanukkah Miracle # 4. The party was a combination of Hanukkah and a “seudat hodiya”, a feast to thank God. This Hanukkah, Estee Lerer, age 28, who donated a kidney several weeks ago, insisted on making a thanksgiving feast together with Dargash Tarfa, age 23, the recipient of her kidney. What a Hanukkah party it was! Mr. Tarfa, who was born in Ethiopia, had immigrated to Israel with his widowed mother and six siblings. He had been on dialysis for three years! Mrs. Lerer was of Hassidic background and had wanted to donate a kidney since she was 16 years old. Despite their different backgrounds, he and Mrs. Lerer were a perfect kidney match. The successful surgery took place at Hadassah Hospital Ein Kerem. The party was held in the basement of a synagogue near Hadassah Hospital Mount Scopus. Mrs. Lerer and her siblings cooked all the food. The Lerer family arrived first, dressed in their festive attire. A little later, the Tarfas arrived in a van from Lod, where they live. Mr. Tarfa’s mother, grandmother, and aunts were wearing long white embroidered dresses, traditional holiday garb for Ethiopian Jews. Mr. Tarfa, feeling fit for the first time in years, ate heartily and danced. The festivities culminated with Mr. Tarfa lighting the Hanukkah candles and chanting the blessings. When he got to the part of the blessing “sh’ asa nissim” about “miracles for our ancestors in those days, in this time,” Mrs. Lerer’s husband, Hanan, shouted out the word “miracles!” The only disappointment was that surgeon Abed Khalaileh, who operated both on the donor and the recipient, could not be there. He was performing another life-saving transplant in the underground operating rooms of Hadassah’s Sarah Wetsman Davidson Hospital Tower. This time, he was transplanting a liver. The families send thanks and blessings to the supporters of Hadassah around the world! See the story of the Organ donation.